The Free University of Amsterdam (Vrije Universiteit Amsterdam) validated all degrees of EGST on March 14, 2019, after an extensive international peer review of the programmes. 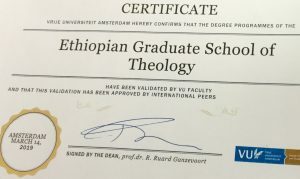 In a certificate of award signed and sealed by the Dean Prof. Dr R. Ruard Ganzevoort, the validation has been approved by the Faculty of Religion and Theology of Vrije Universiteit Amsterdam (VUA) and accepted by international peers. Dr Desta Heliso, former EGST Director and PhD Coordinator who accepted the certificate at VUA, Amsterdam expressed that his trip was a success not only in relation to the PhD programme, but also for the validation of the MA programmes as a positive achievement. He noted that his trip was successful and it was more than his expectation in meeting more than three times with VUA community. Concerning the visibility of EGST, Dr. Desta claimed that the image of EGST is quite outstanding and that we need to harness the image in a more depth. ‘We have to guard the reputation. We are now at crossroads because of the competition’ which is manifested quantitively and qualitatively, Dr Desta cautioned. The MA validation certificate has a tremendous value in that the programmes at EGST are internationally recognized. VUA, particularly the Faculty of Religion and Theology which started along with the beginning of the university by former Prime Minister of Holland has kept its legacy intact while many departments including the department of Philosophy came under humanities. Since the faculty had a cloak at our programmes, reviewed by peers and granted recognition, anyone who graduates from EGST can pursue their doctorate in VUA and other universities in Europe. It was also recalled that the Free University of Amsterdam signed a Memorandum of Understanding and launched a joint PhD programme at EGST in October 2017. For the past five years EGST has been in partnership with the Free University of Amsterdam (Vrije Universiteit Amsterdam). VUA was founded by former Prime Minister of Holland Abraham Kyper in a mission to produce students who can generate relevant ideas for the society by critical thinking towards Christianity and Theology. It was also recalled that the Association for Christian Theological Education in Africa (ACTEA) granted accreditation to the five programmes of the Ethiopian Graduate School of Theology (EGST) and EGST is further pursuing accreditation opportunities from the Ministry of Science and Higher Education, Federal Democratic Republic of Ethiopia.